If you or someone you love is living with Alzheimer’s disease or dementia you’re not alone. Between 4-5 million Americans are directly affected by a similar diagnosis in their family. It can be frightening and overwhelming. There are ways to make life more comfortable and easier to cope with. Many fear the prospect of needing outside help. They vow never to resort to a nursing home facility. It’s difficult to manage the responsibility alone. Assisted living facilities can be a solution. It solves any safety and care concerns and provides a higher quality of life through the staff and resources available. You are only one person and though you may have family member and friends to offer support it’s impossible for you to do everything a fully staffed facility can provide. When a loved one is living with Alzheimer’s the rest of the world doesn’t stop. There are still bills to pay, obligations to be met and responsibilities to fulfill. This can be impossible when all your time, energy and resources are going to keeping your loved one safe. When you’re not there, you worry that they may need something or be at risk of injury or harm. Every area of your life is affected and your health can start to suffer as well. You can’t do your loved one, the rest of your family, your career or yourself any good if you’re ill from exhaustion. An assisted living facility provides a safe environment with resources to improve the quality of life for the resident and their families. Many worry that asking professionals to care for a loved one is neglectful or in essence, robbing the family of time together. An assisted living facility can actually provide the gift of quality time rather than quantity. When loved ones are no longer solely responsible for the care and well-being of their family member it is easier to enjoy and fully appreciate the time they do spend together. Caregiver burn out can make loving families feel resentment, anger, depression, anxiety and other difficult emotions. Feelings that creep into the relationship only because of pure exhaustion and hopelessness in an overwhelmingly difficult situation. Assisted living facilities can provide resources and activities that improve the residents quality of life in ways that family care can’t. Many individuals living with Alzheimer’s at home become shut-ins. They suffer from loneliness, depression and deteriorating health because of their isolation. Assisted living facilities offer residents forms of socialization through activities designed specifically for those with dementia. Safety and proper nutrition are easier to ensure in a facility with full staff and medical training. Life is stressful enough without the world resting solely on your shoulders. This is especially true when facing a future of living with Alzheimer’s. 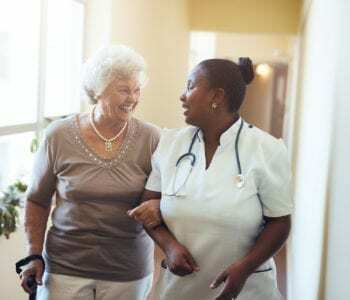 You don’t need to do it alone and can gain some peace of mind and support through assisted living facilities that specialize in caring for those in your situation. Contact us today for more information about how we can improve your quality of life and give you a lasting peace of mind.